It is easy to say that we want our schools to adopt a 21st century learning program; it is only a little bit harder to describe what that program looks like. The real work, we all know, is in the execution. Ken Kay and Val Greenhill, the team who led (Ken was Founding President) the Partnership for 21st century skills (P21) recognized this a couple years ago, and shifted the focus of their important work from calling for this transformation and from describing a program to, instead, supporting the leaders who are executing it in their districts and schools, in a new organization called EdLeader21. In doing so, they are working with, supporting and learning from, an assemblage of some of the very most interesting and exciting school superintendents in the country, including Pam Moran, Jared Cotton, Jim Merrill, and, right here in Tucson, Mary Kamerzall. With the benefit of this experience, they have now written a very valuable, very informative book, about which the only significant criticism is that it leaves the reader with an angst for more– more such information, more detail, specifics and examples: when is the sequel coming? I’ll throw in a few notes here about the areas I most hope to hear more about. Full disclosure time: I enjoyed greatly my one year experience with edleader21, and have been an advocate for that organization. I know Ken and Val personally, and am delighted to be neighbors of a sort with them here in Tucson (in fact, I am writing this in a central Tucson Starbucks, and I keep looking over my shoulder in case one or the other of them walks up behind me). The complimentary copy of the book I am reviewing was sent to me as a kind courtesy on their part, with a warm and generous inscription. Ken and Val’s first step is, of course, the essential and universal first step: “Adopt your vision” (just as my version of the seven steps commences with “Develop your vision (and Keep developing it.”) The discussion here is rich and invigorating; it will energize readers. There is no single version for 21st century student success that is the same in every school or district. Lasting success always comes down to leaders like you. For the vision to make an actual difference in students’ lives, it must come from and be embraced by the leaders of the school and district. A vision that is born of genuine, authentic, passionate leadership is never simple, never cookie-cutter, and never easy. But it is necessary. I have finally found the thing in education that truly motivates me and it’s this 21st century education initiative. This is why I am supposed to be a leader in this field. The overview of the 8 key “perspectives” which are bringing so many to this appreciation for the importance of a shift in teaching and learning is excellent; I learned a great deal. There is a powerful graph showing the change in workforce categories coming into our century, and good stats from a 2010 report that more than half of companies surveyed do measure the 4Cs in their performance review. in the US today we tell our kids the same thing 100 times and on the 101st time, we ask them if they can remember what we told them the first hundred times when in the 21st century the coin of the realm is if they can look at material they have never seen before and know what to do with it. This first step/chapter, by itself, would be highly worthwhile reading for boards, education students, and others. The discussion of the 4Cs is succinct but compelling; I value the emphasis they place on critical thinking: their nugget from David Conley is great. habits of mind such as analysis, interpretation, precision and accuracy, problem-solving and reasoning can be as or more important than content knowledge in determining success in college course. It is great to see the short endorsement of Project-based learning in this section, under the self-direction heading, and it makes me wonder whether there could or should have been in this book more frequent discussions of the pedagogical strategies which they believe best advance this agenda. The 4Cs are the attributes of 21st century leadership. Indeed, in a very appealing and coherent way, each of the subsequent six steps are organized around the 4cs. Communicating the vision comes in many forms, and their discussion of storytelling as a strategy is one of the best pieces of the book. I won’t spoil it here, as much as I want to: buy the book and study pages 28-29 as if your life depended upon it. But I will pull out one specific suggestion: visit schools as you seek to build your story repertoire. You can’t build your story base in your office or own your computer: get into the classroom. What I would add is, get into the classroom and write about it right away. I am such a fan of this: take your laptop, visit classrooms, and blog what you are seeing in real time, sharing with your readership what you are seeing, what you like, and why you like it! But they take Step 2 much further than my piece does, applying the collaborative lens here, and give excellent examples of the way some communities have carefully worked to build consensus, with Virginia Beach being such an outstanding example. Engage your community, engage parents, teachers and students, bring them all into the process early and often. For me, engaging the business community has never been an instinct or an impulse, so I resist some of that discussion just a bit, but I am sure in some districts and situations that might be valuable. took on what it regarded as an important task: the development of a tool to help evaluate student progress in the each of the identified 21st century skills. The team came up with a continuum that identified levels of attainment of these skills, so teachers could identify what critical thinking looks like as a student progresses from a basic skill level to advanced. However, as that group proceeded with its work, it made a big shift, and what began as an assessment tool became an instructional planning tool. I love this story, and I think it such a fascinating example of the power that comes from a focus on assessment. Begin with the end in mind, as Covey and Wiggins preach, and great things will follow. I have spoken several times to Jared Cotton about what I am pretty sure is this event, as he organized teachers to develop performance task assessments like those of the CWRA, but for middle school grades, and he said that that process turned into a very valuable professional learning experience for all involved, and changed the way they teach. Step/Chapter 3 also directs readers to the P-21 MILE guide, which I admit I ought to spend more time with and learn better myself. It is a good resource for schools of all kinds embarking on strategic planning and wanting to conduct self-assessments to situate themselves and chart their course. The PD plane is in such a state of repair no one wants to get on. They are entirely correct, in my opinion, to argue that the key here, as practiced at High Tech High and other innovative schoolhouses, is collaborative learning and PLCs. This has to be the way: teachers learning from and with each other, in reflective practice and in exploration, embedded in the day to day norms and culture of the school. The vision for 21st century outcomes must be a primary focus for the content of PLCs. Some PLC advocates and peer coaches remain neutral about what “content” is delivered through the PLC. There is nothing wrong with that. But for you, as a leader of a 21st century district or school, it is important to make clear what the essential purpose of any revamped PD strategies should be. The PD program and its practitioners must understand that they should be focused intensely on the 4Cs and the other outcomes that your educational community has embraced as its vision for 21st century education. The Dufours also make this point in their work. They emphasize it is not enough to simply define the existence of PLCs; providing the time for PLCs to meet won’t guarantee the success of PD or your vision. 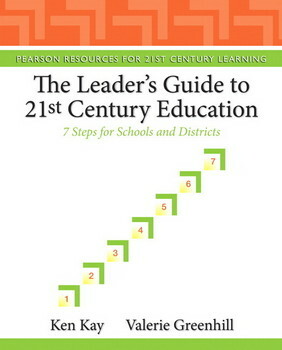 The PLCs must be focused on the 21st century challenges that the school or district has embraced. I was sorry to see something of a glaring absence in this section of two of the most important and critical recent developments in professional learning: PLNs and unconference/edcamps. As John Seely Brown and Howard Rheingold have brilliantly explained in recent books, the opportunities for learning that exist in online networks are almost infinite, and we have to help our teachers and our students plug in. Just as importantly, we are seeing a remarkable revolution in the way teachers learn in models such as Edcamp, where they come together to teach each other in very meaningful and supportive ways. We can (and I have) develop and advance both of these models in our schools and districts, and it is essential that we do. Step 5 is entitled Focus your Curriculum and Assessment, and the rich part of this chapter is the discussion of multiple assessment models. It is funny, when I compare this book to the recent Marzano publication, Teaching and Assessing 21st century skills, that despite the title of the Marzano, this Kay/Greenhill book has a vastly better overview of current developments in assessment. Anyone interested in the all-important topic of next generation thinking about assessment (sometimes referred to as “beyond the bubble”) is advised to buy this book for this chapter alone. The recommendation Kay/Greenhill offer is that videos like this offer a way for leaders to engage teachers in reflective consideration of teaching technique, and that this is favorable to handing out directions. Good point. Learning Walks, Instructional Coaches, Making Teacher Evaluations Meaningful, and Supporting teacher with the right infrastructure are also promoted here, with good resources and links to go further in any one of these areas. Myself, I have found it hard to institute learning walks in a way by which teacher feel supported, but this must be, at least in part, because I didn’t approach it the right way. I have found teachers have a very hard time that short, even if frequent, visit/observations can be valuable in offering visitors true understanding of the success of the classroom. As a digital enthusiast and evangelist, I was sorry to see this discussion so abbreviated. In the next book, perhaps there could be an extended discussion of what specific types of tools can support teaching and learning, with examples, case studies, and maybe a bit of research evidence. Step 7, Improve and Innovate. This is a shorter, chapter exhorting rather than fully explaining, which is fine. This is an entirely iterative process, cyclical and never completed. Ken shares several sweet little stories of meeting or encouraging innovators, reminding us that creativity is all around us and open to all of us, at any time: often it is just a matter of “the adjacent possible,” rather than invention whole-cloth. Simply put, I can’t imagine any school-leader– superintendent, board member, school-head, principal, administrator, or teacher-leader– who wouldn’t find this book valuable: informative, illuminating, inspiring. There is such great work for all of us to do in education, and we need books like this to give us examples, case studies, resources, models, and a framework onto which we can organize our strategy for advancement.